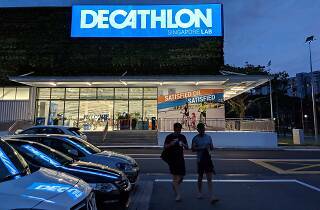 Decathlon Singapore Lab at 230 Stadium Boulevard is Singapore's biggest outlet yet. At 5,000 square metres, the sporting goods store packs more than just equipment, gear and everything you need to be living your best sporty life. 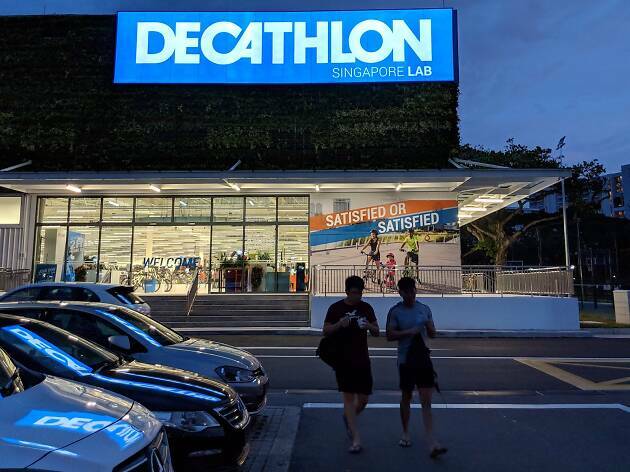 It is also Singapore's fourth Decathlon store – and it is open 24 hours if you ever need a wholesome place to hang out after hours. Teaming up with SportSG, who owns the land, the store features an Active Health Lab where sports events, pop-up clinics and even free health screenings happen. The best part of this sprawling store? The active stations located around the store allow visitors to try the products out themselves (and squeeze in some fun and exercise) before making the purchase. Prices are reasonable and affordable – you can get a skateboard at $25, a lifejacket at $40 and a wide-brimmed hat for hiking at $9.90. Some of the active stations include a surfing corner where you get to try out different boards, several basketball nets to practice your hoops (and try out the range of balls), a skate arena to try out skateboards and kick scooters, a hiking area with different terrain and an entire section where you can have a go at the indoor gym equipment. It's still early in the year to be making resolutions and if working on your fitness and trying more sports happen to be one of yours, start small (or big) at Decathlon.